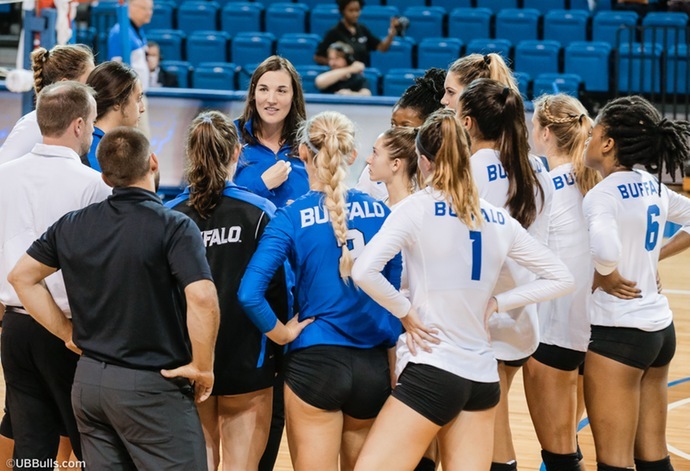 BUFFALO, N.Y. -- The University at Buffalo volleyball program will open up Mid-American Conference play this weekend when the Bulls return to Alumni Arena for the first time in almost a month. UB will host Bowling Green on Friday evening and Miami (OH) on Saturday. Both matches will begin at 6pm and are free to the public. The Bulls enter conference play with an 8-4 record, one of three MAC East teams that won eight matches during non-conference play. Sophomore setter Tia Gleason was named the MAC East Setter of the Week for the second straight week following her 56-assist performance in the four-set win over Howard. Sophomore Andrea Mitrovic leads the Bulls with 171 kills, averaging just under 4.00 kills per set. Bowling Green enters Friday night's match with a 6-7 record following a tough non-conference schedule. Most recently the Falcons won the BGSU Invitational following wins over Marshall, IUPUI, and Nicholls State. Bowling Green returns the MAC Defensive Player of the Year in libero Kallie Seimet, who led the nation in digs last season at 6.81 per set. This year she has 287 digs so far, 6.24 per set. Miami enters its match on Friday night against Akron with an 8-4 record following weekend victories over Oakland and St. Francis (PA). Margaret Payne leads the RedHawk offense with 100 kills and she is currently fifth in the MAC hitting .342 on the year. Defensively, Stela Kukoc has a team-high 118 digs, while setter Morgan Seaman adds 104. Payne is also Miami's leading blocker at 1.07 per set. For fans unable to attend this weekend, Friday's match against Bowling Green will air on ESPN3, while the Miami match will stream for free on Youtube. Links to the video and live stats can be found on UBBulls.com.